Mr. Chawalit Manovilas, the high experienced businessman is founder of Commy Corporation Co., Ltd., Mr. Chawalit Manovils has done retail business before and then found that this business is fast growing in that period so he has changed from retail business to be imported from abroad to distribute until 1994 he has established factory to produce own battery by joining with Toshiba by bringing battery cells to produce and then in 1995 Sanyo has joined venture with Toshiba. So, we have joined as partners with Sanyo until 1997, we have build Commy Brand and in 2012 Panasonic has joined venture with Sanyo. Since that we have joined as partners with Panasonic also. It makes us are the only one distributor battery cells in both Sanyo and Panasonic in Thailand. So, our company has certified international quality system from SGS with ISO 2001:2008 which is international standard that has been official accepted worldwide. Moreover, Commy is the first manufacturer that received TISI Standard from Ministry of Industry. So, it is recognized for quality products and production standard which make consumer is confident with company’s product. 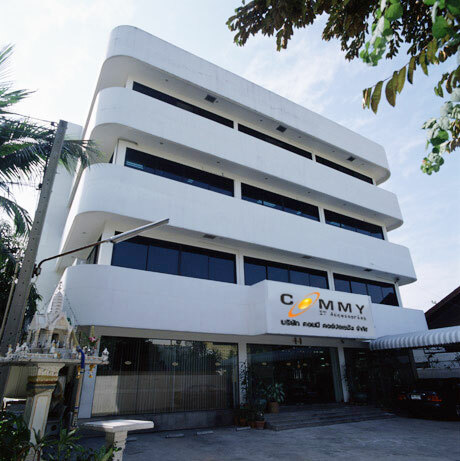 Commy Corporation Co., Ltd has adjustment and improvement continuous for consumer command. Nowadays, consumer has followed technology all the time and demand in different technology which present power charger market is growing complete with smart phone market which is the main factor that made us develop our products all the time and communicate in highlights of product via channel marketing. Let’s consumer has known advantage of standard product which still has many information that have not disclosed to customer to know about correctly information and facts about product which can build acknowledgement, acceptance, confident in product quality and recognize brand, it makes customer decides to buy our product easier. Today Commy is entering to the year of 23rd from battery product and accessories in early until latest innovation “Water Resistance Power Charger” and various gadgets which we are still developing continuous for meeting all your demand as our slogan” COMMY always go with you.